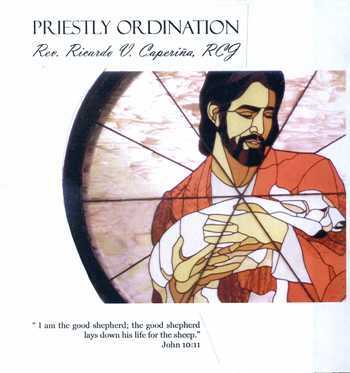 With great joy and gratitude to the Lord the Congregation of the Heart of Jesus and the Vasquez-Caperiña family invite you to the Priestly Ordination of Rev. Ricardo Vasquez Caperiña, RCJ, on July 14, 2012, Saturday, at 10:00 in the morning at St. Francis of Assisi Parish, Sariaya, Quezon, Philippines, With His Excellency Most Rev. Emilio Z. Marquez, D.D., Bishop of the Diocese of Lucerna, as the Ordaining Bishop. The first Thanksgiving Mass will be at 3:00 pm.